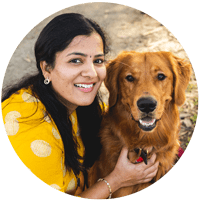 My blog doesn’t need any intro to vaandu’s paneer love. I do make paneer often especially during weekdays, but somehow it doesn’t come to this blogging space. 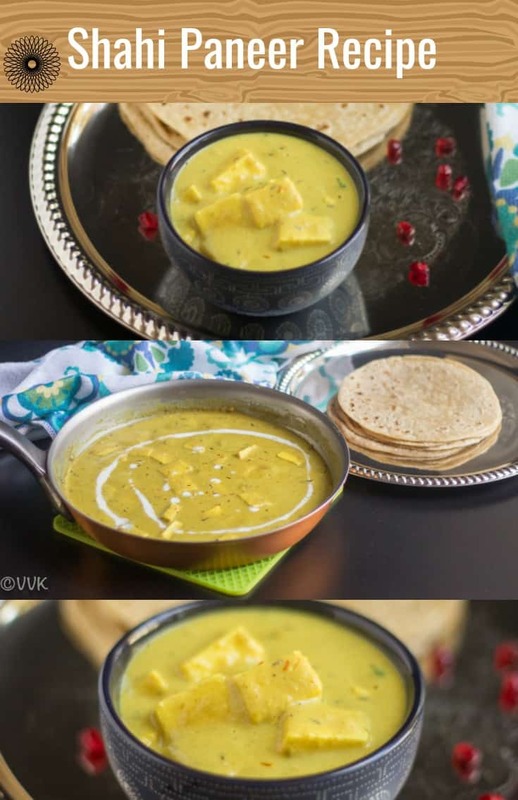 Shahi Paneer is one such recipe, and finally, I got a chance to post here. 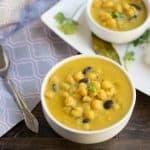 Shahi Paneer is a mild and sweet gravy with a lovely golden color when compared to the other Paneer gravies like Paneer Butter Masala or Matar Paneer. My version is much sweeter and mild as I add cream as well as sugar. Wondering why? Just to make the kid, approve the recipe. 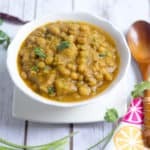 I don’t include tomato as well as red chili powder, but I do add yogurt and green chili which helps me to get that beautiful golden color gravy. 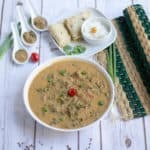 Doesn’t this gravy remind you of another royal recipe from my archives? 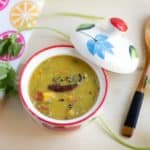 Yes, it’s the Sultani Dal. 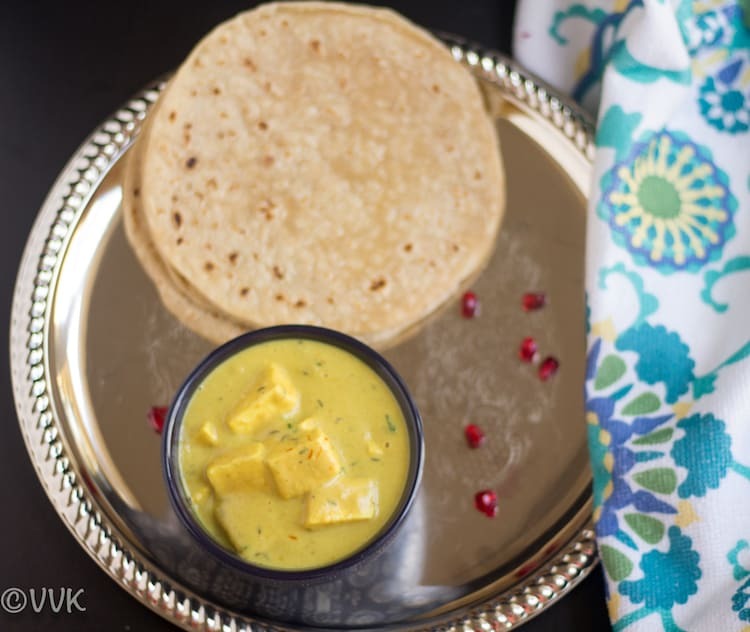 Make a splendid menu with this Shahi Paneer, Sultani Dal, Saffron rice and paratha/kulcha. 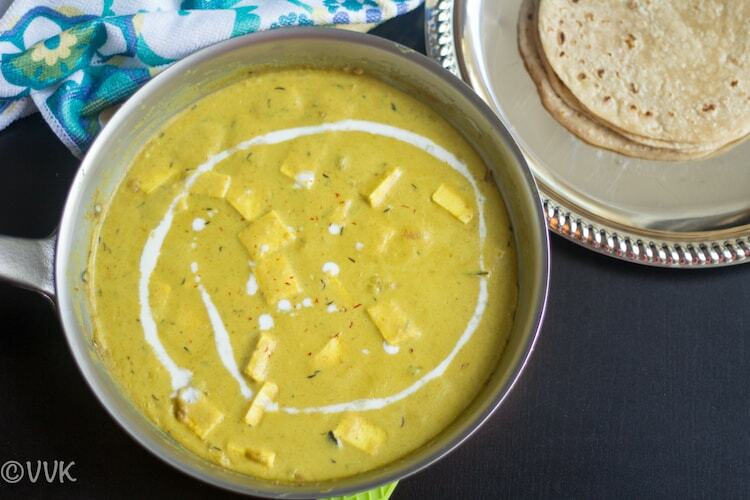 One more exciting recipe is coming up this week with this Shahi Paneer. Stay tuned. Without any further ado, here is my version of Shahi Paneer. 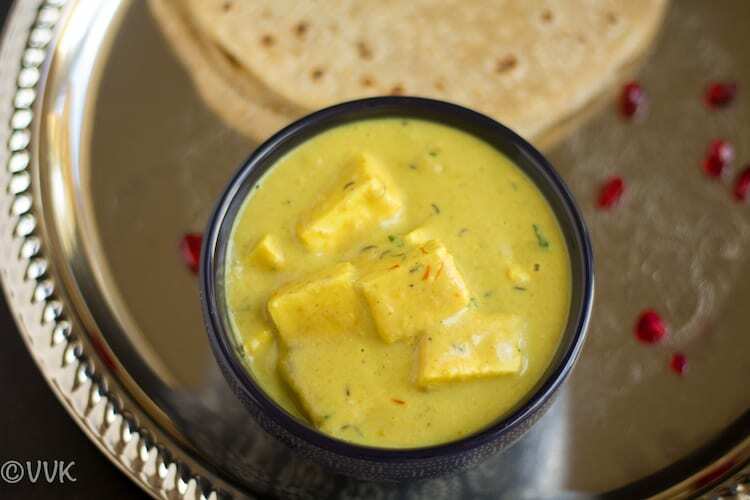 Shahi Paneer is a favorite roti/naan accompaniment from our Indian Subcontinent prepared with whole spices, nuts, paneer, cream, yogurt and with a hint of saffron. 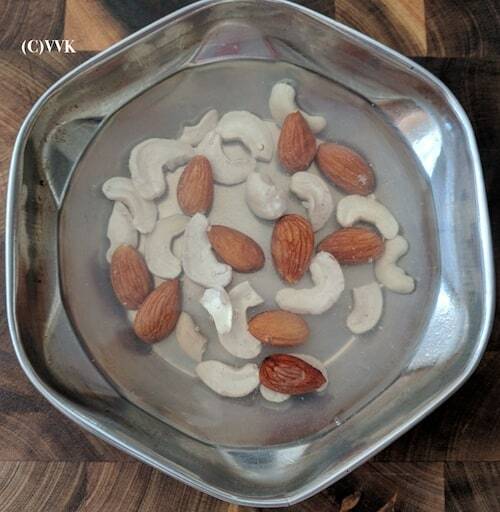 Soak the almonds and cashews in water for at least 20 minutes. Peel off the almond skin. 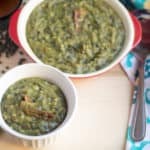 Chop the onion and slit the green chili. 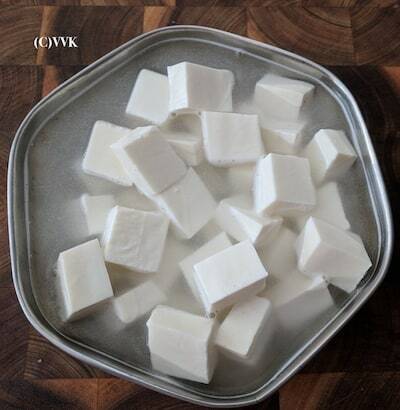 Cut the paneer into small cubes and soak in hot water. 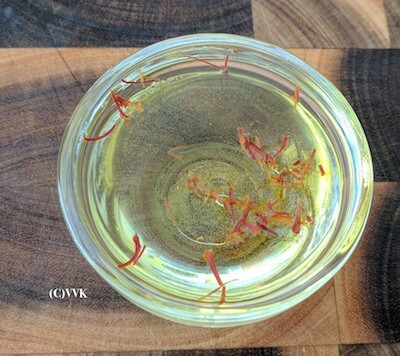 Soak the saffron in 3 tbsps of water. Heat a pan or kadai and add butter. Once the butter melts, add the onion and green chili. Then grind this onion, green chili along with soaked nuts but adding 3 to 4 tbsps of water. Heat the pan/kadai and add the remaining butter. Saute for a minute and then add the ground shahi paste. Along with that add turmeric powder, coriander powder, and garam masala. Then add salt and sugar and cook for a couple of minutes or until the butter separates. Make sure the paste doesn’t get burned. Next, add the yogurt and mix well. Cook for two minutes and add two cups of water. I added the water that I used to rinse my mixer jar after grinding the shahi paste. Mix the gravy and let it simmer for 4 to 5 minutes. Keep stirring for every one minute. 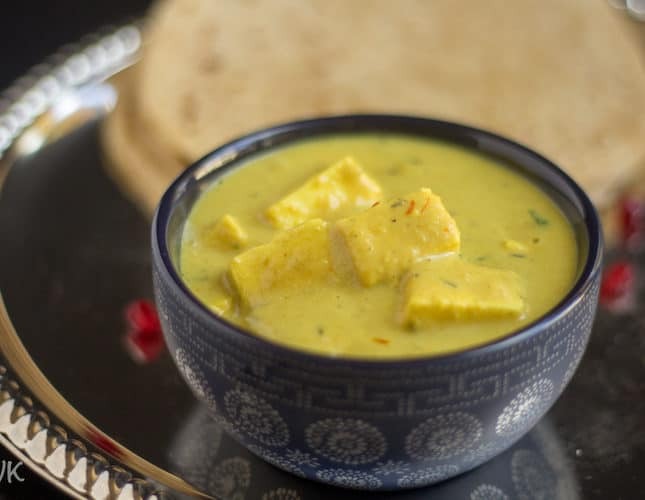 If you are soaking the paneer, drain the water and add it to the gravy. Also, add the saffron water and stir it. When the gravy begins to boil, you can turn off the heat. Finally, add the cream and kitchen king masala. Mix them and serve hot with naan/roti/kulcha. Soaking the paneer in hot water and adding kitchen king masala, in the end, is entirely optional. Adjust the sugar, salt, and spices as per your preference. I went with two tbsps of yogurt, but you can increase it up to 1/3 to 1/2 cup too and not use the cream at all. Also, make sure the yogurt is not too sour. Then add salt and sugar and cook for a couple of minutes or until the butter separates. Make sure the paste doesn't get burned.